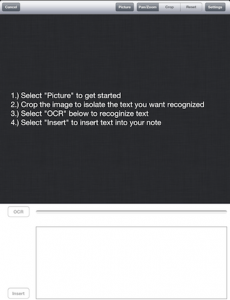 There are many applications that do word processing but this one from Nuance goes further than most. 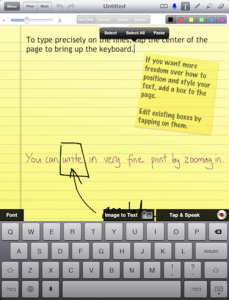 It actually lets you take advantage of dictation on your iPad. Considering Nuance brought us Dragon dictation, it is not surprising dictation transcription is part of the application but it is integrated very well. The dictation is available in several languages: English (English, American, Australian), Spanish (Spain, Mexico, the Americas), Italian, Dutch, Portuguese (European), and French (France and Canada). The dictation on the software understood me very well most of the time, however it wasn’t perfect. For an example I use Siri a lot, and it worked about the same as Siri does which is about 80% of the time. You have the normal word processing tools such as different colours to use when typing, as well as thick and thin pens when drawing, which also have different colours you can use. There is an eraser function to remove any mistakes you may make while drawing. 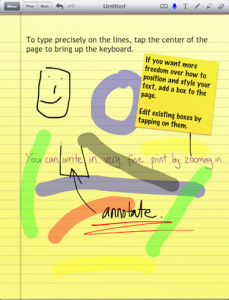 Nuance Paperport Notes also lets you capture images then remove the images leaving only the text that was in them for you to use, which is a nice feature. I can think of many times in the past where this capatbility would have come in handy. When you have finished making your document you can export it in a number of ways: Paperport Anywhere, Email, Google Docs, Box, Dropbox, Print, and through iTunes file sharing. 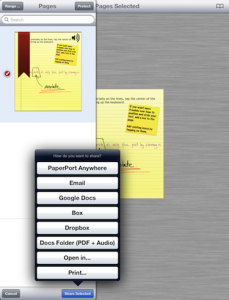 Also you can open the document in iBooks, Polkast, Dropbox, and Evernote. 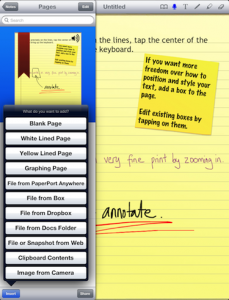 There is also the ability to insert a blank page, white lined page, yellow lined page, graphing page, file from Paperport Anywhere, file from a documents folder, file or snapshot from the web, file from Box, file from Dropbox, clipboard contents, and a camera image. The only downside for me would be it is iPad only. I like universal applications but it’s not a deal breaker. 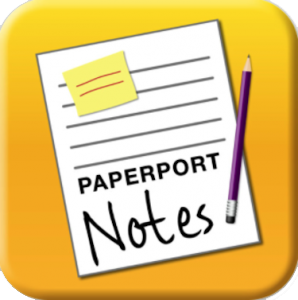 Nuance Paperport Notes is definitely one of the best word processing and dictation capturing applications I have came across.